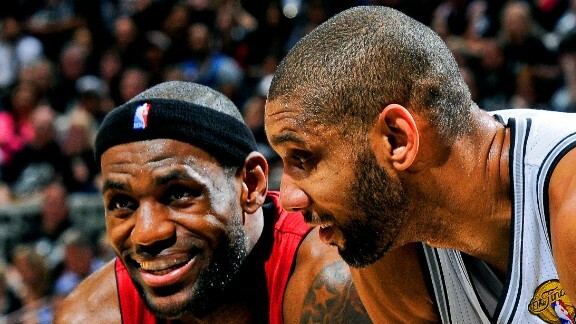 LeBron James and Tim Duncan, by playing against each other in this year’s NBA Finals have lowered their ‘jock tax’ burden and if the series goes the full seven games they will lower them even more. States that enforce non-residence income tax – also referred to as a ‘jock tax’ – allocate an athlete’s income earned in that state by taking the percentage of days in the state and dividing them by the total days in the season. Known as the duty day allocation formula, it takes into consideration all days and includes both the preseason and postseason. Therefore, for every day the season is extended by playoff games the duty day allocation to each state is affected. What are the Tax Savings? Both Florida and Texas, which are home to James and Duncan’s respective NBA teams, do not have any state income tax and the additional duty days actually lowers the taxable income allocated to states that impose non-resident taxes. When you apply this change in allocation to LeBron James 2013-14 Salary of $19,067,500 – to the 19 jurisdictions he plays – he is able to allocate $276,479 of salary out of states that impose the ‘jock tax’. When you apply this change in allocation to Tim Duncan’s 2013-14 Salary of $10,361,441 – to the 21 jurisdictions he plays – he is able to allocate $172,000 of salary out of states that impose the ‘jock tax’. With income tax rates ranging in the ‘jock tax’ jurisdictions from Indiana’s 3.4% to California’s 12.3% the allocated salary out of these jurisdictions ends up being a significant tax savings for both James and Duncan.